health Archives - You're Doing Great, Baby! Leo went back to school today, so the Christmas holidays are officially over. We had a lot of fun. It was nice to have both boys at home together and not be always hurrying to get out the door for school or waking Clem up from his nap to pick Leo up in the afternoon. I am looking forward to having more time to blog and show our book to a few bookshops. Over the holidays I started to read Gretchen Rubin’s Better Than Before: Mastering the Habits of our Daily Lives. It gave me a lot to think about and spurred me on to think about habits I’d like to keep, lose and begin in my life. But I felt a hopeless about implementing her suggestions into my life, to be honest. It sounded like a lot of work and I didn’t have the energy. Clem had just been really sick and I was tired and run-down from the frenetic lead-up to Christmas. Then! In January I went to the dentist and he told me that I have been grinding my teeth in my sleep. I have never ground my teeth before, so I felt really freaked out to have started. What was it all about?! With Gretchen’s words fresh in my mind, I decided that I needed to assess my life and ask myself some questions. Things needed to change. I want to share the questions with you, because answering them has been very clarifying for me. Why do I need to look after myself? What’s at stake? Why do I find it hard to look after myself? Who can I check in with? Why can’t I get off the hook? Answering these questions I learnt that I totally do know how to look after myself, but I just don’t put it into action sometimes. I know all of my excuses and how to counteract them, but I choose not to. After writing up all my answers with pen and paper, I made a one pager that I can stick up on the fridge and remind me what my mission is. Writing up this plan feels like I have a mission in life and everything else flows from here. It’s all about fitting your oxygen mask before fitting anyone else’s. Women especially are taught to look after others before themselves, and I definitely struggle with that. If I’m depleted myself I am terrible at looking after others, and yet I’ve done it all the time. Both before and after having children (I used to always be the friend who looked after everyone in high school for example). But sometimes it’s hard to look after myself. The things on my list of things I need to do to look after myself are things I already did to varying degrees, but now it feels more binding. It’s powerful to have recommitted to why I want/need to look after myself. It takes the element of decision making out of when to do yoga, for example, because I’ve written down the potential days and times I have each week and set myself a minimum number of times a week to get on my mat. I’ve discovered there’s a great strength and self confidence that comes from choosing rules and then sticking to them. It’s not going to be perfect, and it will evolve over time, but I get excited every time I look at my one-pager. It’s all my favourite stuff (that it’s easy not to make time for). 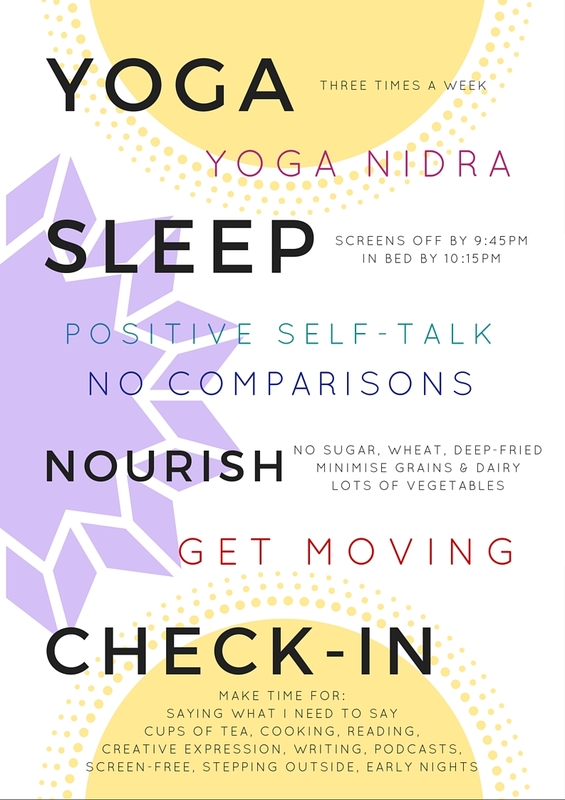 Since committing to this self care plan things have felt like they’re falling into place. I am excited for the year ahead. Wishing all of you a healthy and happy 2016. Have faith that you are where you need to be right now. You’re doing great. After spending the last six years listening to women’s stories of pregnancy, birth and early motherhood, I have seen women dealing with all sorts of challenges. Outside stress (death of a family member, moving house, financial stress). There are surely exceptions, but I can’t think of a mother I know who hasn’t faced one challenge or another (or multiple challenges). It’s as if this is part of a woman’s rite of passage into motherhood. Sometimes women face these challenges alone – not wanting to tell anyone what they are going through. Especially if their issues are hidden, such as injuries from birth or pregnancy. Other times it’s very obvious that they are being challenged to their core. At the time it’s not something you would ever hope for, but often there are amazing insights that can come out of dealing with one (or more) challenges in that early time. 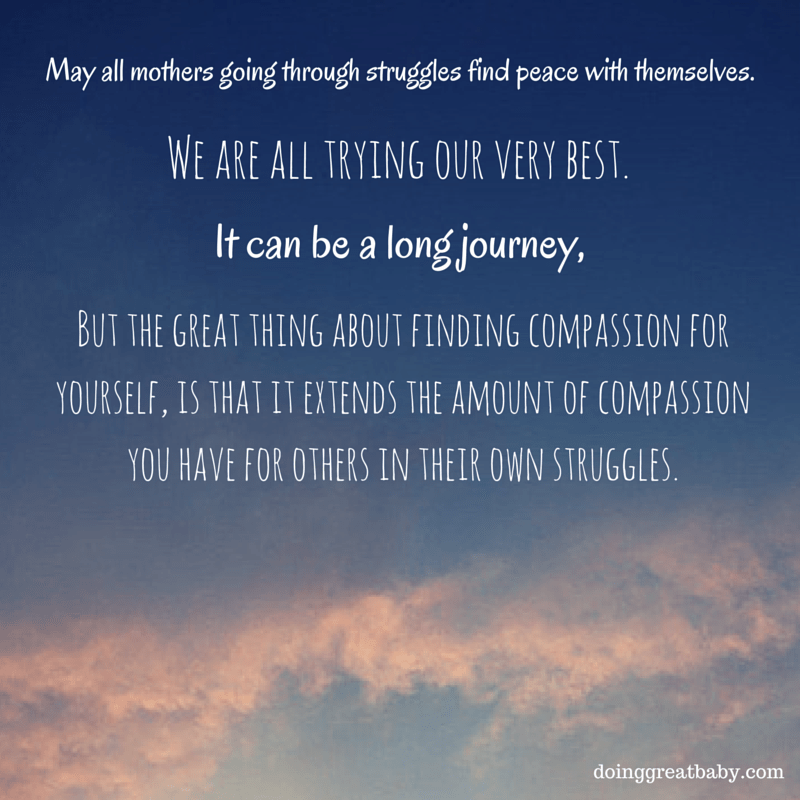 I found that the challenges I faced as a new mum have given me deep compassion for other mothers’ struggles. Our book has been borne out of this compassion and everything we have learnt. Through Leo’s birth I learnt how to communicate my needs and advocate for myself and my child. I don’t feel like I can know for sure what Clem’s birth has taught me until he is a bit older, but one year on it has taught me that surrendering to, and learning from, life’s ups and downs is my life’s work. It’s easy for people who aren’t in a mother’s position to belittle her feelings of loss and disappointment when things don’t go as she had hoped and planned for, or dismiss them as ‘first world problems’. This is so unhelpful. Everything feels heightened with a new baby around and what the mother needs is support and empathy – not “at leasts” e.g. “at least you have a healthy baby”. I had mild postnatal psychosis and postnatal depression after the births of both of my children. I thought that all the work I had done and the lifestyle changes I’d had would mean that I’d be fine after Clem was born, but it happened again. Mental illness is bad enough at anytime, but trying to recover while you’re also looking after and getting to know a baby with round-the-clock needs is extremely challenging. Beating myself up about getting sick again wasn’t productive, but I have had times when I felt like a failure for having it happen a second time. Women dealing with challenges: I salute you. It can feel so lonely to be going through whatever it is you’re going through. I know so well that feeling of just wanting your family to have a happy life free from struggle. I solemnly hope that you find some peace in whatever your sorrow is.